LinkedIn was launched in 2003 and is currently the third most popular social network in terms of unique monthly visitors, right behind Facebook and Twitter. LinkedIn is the world’s largest online professional network with more than 400 million members in over 200 countries and territories. More than half of all B2B companies are finding customers through LinkedIn. A large part of LinkedIn members (67% as of April 2014) are located outside of the US and some of them, including linguists and their (potential or existing) clients, are multilingual. 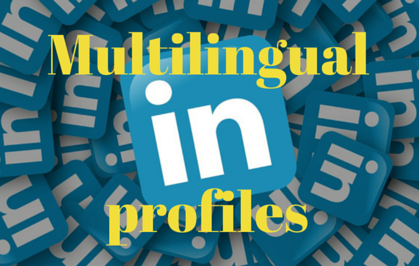 LinkedIn allows users to set up additional LinkedIn profiles in other languages. I think it’s a good idea for translators and interpreters to have profiles in two (or more) languages. A multilingual profile can highlight your linguistic skills and your command over different languages. Plus, it’s great for SEO. The keywords in both your original and your translated profile will boost your online presence and your ranking in searches (on LinkedIn and search engines). You can’t change the language of your primary profile once you’ve set it up, so you need to create a profile in a secondary language through your existing profile. It’s better to avoid creating a whole new profile (with a different email address) because that will mean you having two or more separate profiles on LinkedIn, which might confuse people looking for you. 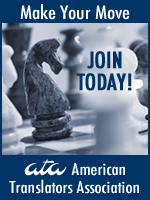 To create your new profile, log in and then click here. Choose your language from the dropdown list. LinkedIn.com shows content and provides customer service in the following languages: English, Arabic, Chinese (Simplified), Chinese (Traditional) Czech, Danish, Dutch, French, German, Indonesian, Italian, Japanese, Korean, Malay, Norwegian, Polish, Portuguese, Romanian, Russian, Spanish, Swedish, Tagalog, Thai, and Turkish. Other languages are being considered for the future (Greek is not high on the priority list when I last checked in 2014 during a LinkedIn presentation at Localization World in Dublin). You can see the languages supported for LinkedIn mobile applications here. Localize your first and last names, if needed, and then translate your professional headline (having in mind the usual tips: take advantage of the space and don’t just say “Greek translator”, try to include a benefit your clients get from working with you). Edit your new profile. Translate or write in the secondary language the following in this order of priority: Summary, job titles and descriptions in the Experience section, Advice for Contacting. Then, go through the rest of the sections and localize as necessary. Whatever else you translate in your secondary profile is a bonus, but the three sections I highlighted are important because they are the most visible parts of your profile, the ones that potential clients check and use to decide if you might be a good fit for their translation/interpreting project. Visitors will see your profile in the language that matches the one they’re using the site in. For example, if someone is using the LinkedIn French interface and you’ve created a French profile, then they will see your French profile by default. If they’re using the site in a language that you haven’t created a secondary profile for, they’ll see your profile in the language of your primary profile. All of your language profiles are indexed in search engines and have their own URL, i.e. if your primary profile is linkedin.com/in/yourname, then the French profile would be linkedin.com/in/yourname/fr. When a LinkedIn user has a multilingual profile, there’s a button on the top right side of their profile, View this profile in another language, and when you click on it, a dropdown menu appears with the available languages. I think it depends on your clients’ location and language. I’m an English to Greek translator and almost all of my clients speak English. Even the ones based in Greece have English profiles. So, I decided that for now an English-only profile works fine for me. If your clients speak your source language instead of your native, a LinkedIn profile in that language would greatly increase the chances of them finding you on LinkedIn and online. If you have a LinkedIn profile in more than one language, please share your experience in the Comments below. Was it easy to set up and localize? Has it received many views and has it led to translation or interpreting work?